Green Hell is a psychological survival game in which you'll need to regularly check your body "for parasites, infections, and wounds" while trying to escape the harsh Amazon rainforest. I don't know what it says about me that I'm into that body-horror bullet point but, let me tell you, I'm into it. The developers at Creepy Jar previously worked on games like Dying Light at Techland Warsaw. For Green Hell, they're striving for a certain amount of realism in the "world building and gameplay." 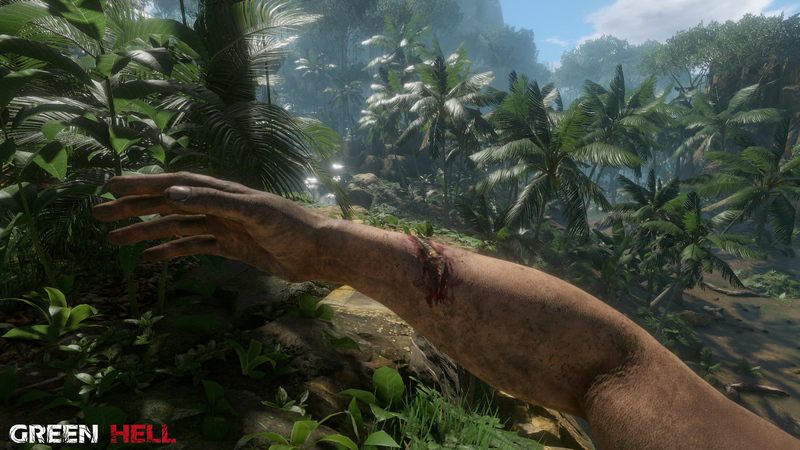 After waking up in the jungle, you'll face threats ranging from plants and animals to infections and sickness. In that respect, the game has a slight Far Cry 2 vibe going for it. I expect gross animations. "Clinging to life, the player is set on a journey of durability as the effects of solitude wear heavy not only on the body but also the mind. How long will can you survive against the dangers of the unknown? Having only a radio at your disposal you will follow a familiar voice through a seemingly endless and ruthlessly inhospitable jungle. Bit by bit, you will unveil more of the mystery of how you came to be in this hostile situation and what you discover just might be worse than what you fought so hard against to survive." It's a decent enough premise, and if the survival bits are well-executed, this could be memorable. Green Hell is planned for Early Access this summer, with console support coming after the PC version.